The whole family is invited to come enjoy a day of free fun at the Pride-Chaneyville Branch from 10 a.m. until 2 p.m. Saturday, October 27, for the 10th Annual Community History Festival! 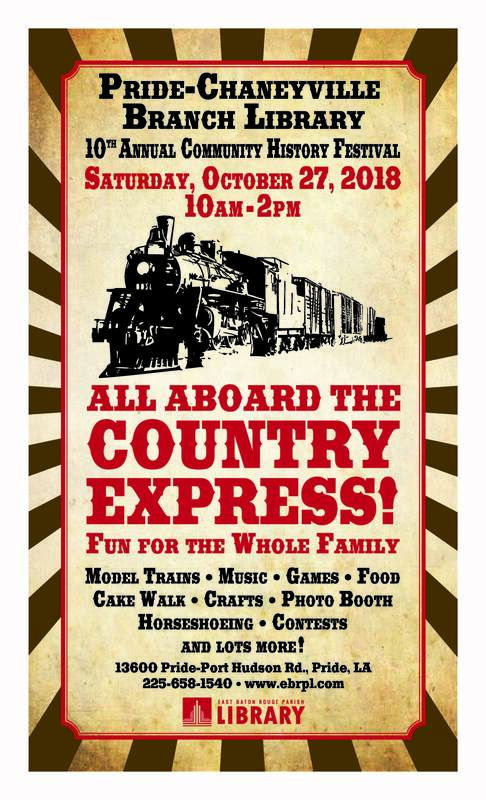 This year’s theme is All Aboard the Country Express, and we’ll celebrate with model trains, fun crafts, music, delicious food, a photo booth and more! Activities also will include a live horseshoeing demonstration, farm animals, face painting, pumpkin painting, sack races and of course, the Old-Fashioned Cake Walk. Local vendors will be available for the purchase of homemade and handcrafted items. For more information, call the Circulation Desk at the Pride-Chaneyville Branch at (225) 658-1540. Next Next post: Watch “Coco” Friday, October 26th, at the Main Library!